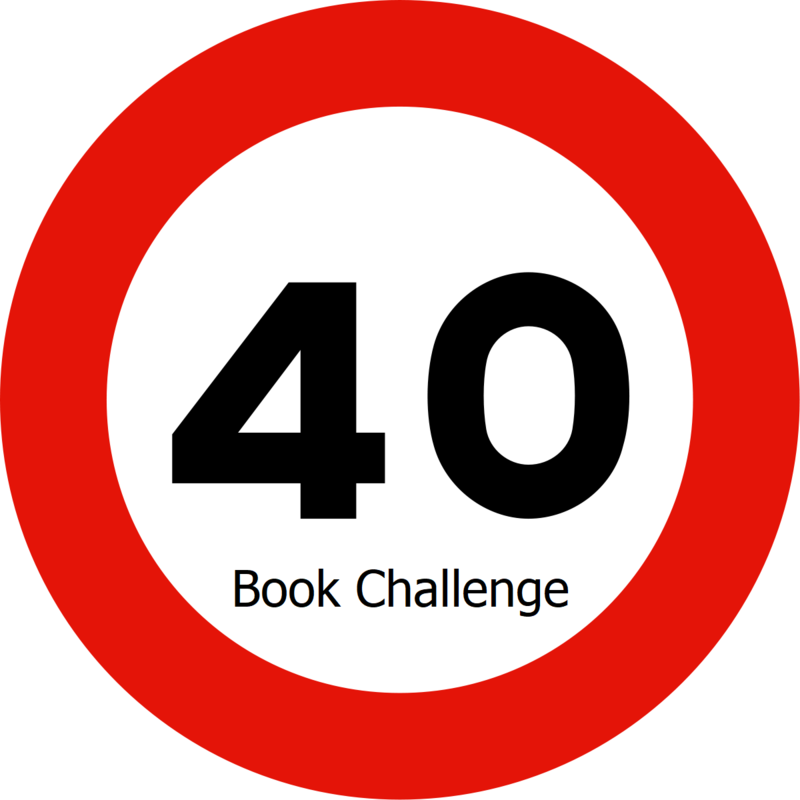 I know I’ve mentioned Donalyn Miller’s Book Whisperer before, but I wanted to share how she’s inspired me to start the 40 Book Challenge with students in my class this year. More than I want students to be able to score well on a standardized test or receive high marks on their report cards, I want students to love reading. To be honest, when I was a kid, school turned me off to reading. Book reports and assigned books made reading boring and tedious. The good news is that there is a better way! Here’s the gist of the challenge: read 40 books of varying genres over the course of the year (really, that’s it at its core). I won’t be requiring students to read at a certain lexile level, and they won’t be graded on whether or not they read 40 books. 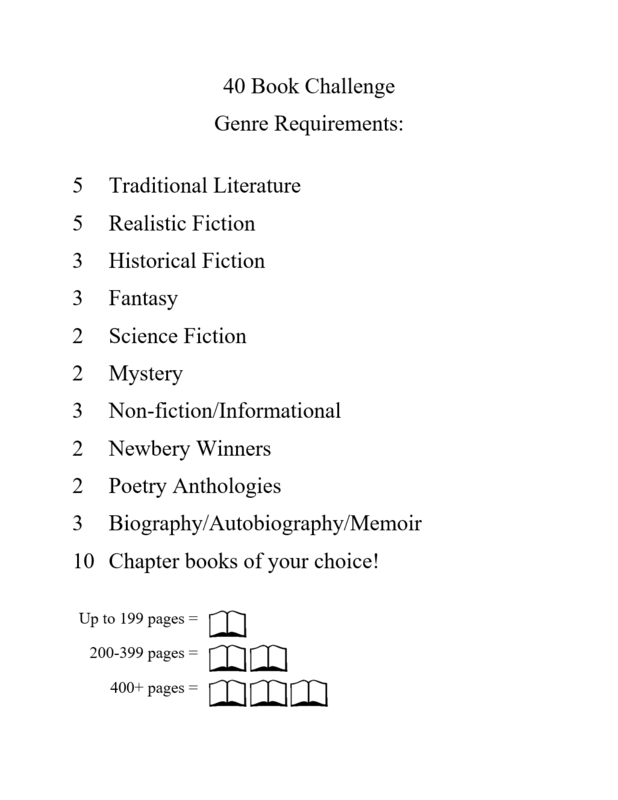 There’s a bit of wiggle room on the 40 books requirement so students aren’t punished for having a lower reading level or for reading larger books (see image below). Students won’t have to read from a set of books mandated by the district or teacher, but will have absolute choice in what they choose to read, as long as they meet the the genre requirements provided. The idea is to let students explore different genres, exposing them to some great books that interest them. While I’ll do my best to make meaningful suggestions to my students based on their interests and reading habits, I want to leave the decision making up to them. As students are left to explore books that interest them, the hope is that they will enjoy reading and continue to read once they leave the classroom. Students are free to select and abandon books at any time if they lose interest. Life is too short to read boring books! To track my students’ reading comprehension, students will write me a short personal letter in a spiral bound notebook once each week. Students will turn them in on different days throughout the week, and I will respond to their writing with a quick letter of my own, asking them to make predictions, inferences, in depth analysis of characters and settings, etc. Once a student finishes a book, they will create a book commercial. When creating book commercials, students can choose to create a digital or physical (paper) advertisement for the book, an audio/radio commercial, or a quick personal video. Students will share these out with the class as books are finished, and they will be encouraged to be honest in their assessment of the book. When students share these commercials and recommendations from their friends, if another student is interested in reading that book later, they can add it to their “Books I Want to Read” list. This is great both because students are creating not just consuming, which requires deeper levels of thinking, and because students will have a list to select from when it’s time for a new book (less wasting time digging through books and more time spent reading). I’m believing for some great outcomes this year, and am excited to see my students develop voracious reading appetites. What do you think? Do you do something similar, or are you held to a rigid reading program or curriculum where you teach?